There are a large number of Indigenous students here at Laurier and two of those students happen to be sisters on the Golden Hawk women’s basketball team. Skye and Hunter Johns are two forwards on what is a very young and talented women’s basketball roster. Although Skye finished her Master’s degree last year, she decided to come back for one more year for a simple reason: to play basketball with her sister. “I already have my Master’s [degree] and I knew that [Hunter] got in the basketball team so I came back and got into a different program, basically just to play basketball. It’s way more fun to play with my sister,” she said. Although this is Hunter’s first year with the Hawks, she is no stranger to post-secondary varsity basketball as she has already spent three years playing basketball for Mohawk College. Hunter has been a massive addition to the team, already contributing with 41 points and 14 assists through eight games. The Johns sisters are not only extremely important for Laurier’s basketball team, but they are also a crucial part of the Indigenous community at Laurier. “It’s empowering [to represent the Indigenous community] and I feel proud. I like that there’s an Indigenous presence. In school, we learn about Indigenous people and their history, but we don’t learn about how Indigenous people are living today,” Skye said. “It’s been nice to see how everyone plays and who brings what to the table. We also don’t have a full bench yet, so I think we should be more on the same page in the second half of the season,” she concluded. Hunter added that being a part of the Indigenous community is her identity. “Being Indigenous and playing post-secondary basketball is all part of my identity. My culture is everything; I am my culture before I am a basketball player. It keeps me connected in that way,” she said. It was Laurier’s “Embrace Your Culture” night on Nov. 10 and despite the Hawks’ loss to the Ryerson Rams, it was a night to remember for everyone. The team decided to take a knee during the pre-game national anthem in order to raise awareness about the missing Indigenous women epidemic currently taking place in Canada. “We get to teach our teammates [about our culture]. A lot of our girls don’t know about Indigenous culture and how we are today. Just by being there, we get to stop stereotypes from happening and we get correct and inform people. We took a knee when the anthem was playing on ‘Embrace Your Culture’ night just to raise awareness for missing Indigenous women in Canada,” Skye said. Through eight games so far in the 2018 season, the Golden Hawks have an overall record of 2-6. It’s been a tough start to the season for the team, but the players recognize what they need to do in order to improve. “[It’s about] doing all the little things well and keep doing them well. Little things like boxing out every single possession, every single shot. Once we can do the basic things well without hesitation, everything will come together,” Hunter said. “Obviously we don’t have the greatest record right now, but we know that we have a lot to improve on. We realize that we need to start practicing harder and not take things for granted. We are also a young team,” Skye said. The Hawks record should continue to improve as their schedule eases up during the second half the season and as the team starts to mesh together. 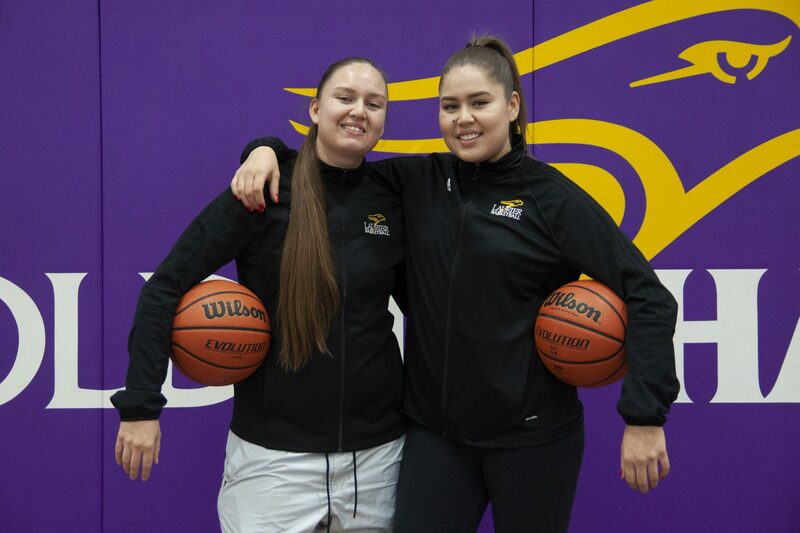 Skye and Hunter are not only a pair of talented basketball players for the Golden Hawks, it is evident that they are also great role models for the Indigenous community and the student body as a whole at Laurier.